A sign said "This is what YOU can grow in Canada." My father, George Parrett,in England, saw a poster showing a wheelbarrow with a single pumpkin filling it, boasting- "This is what YOU can grow in Canada!" and promosing "FREE LAND". He was hooked! A relative, Percy Hammond, had preceeded him to Winnipeg, so he headed there in 1908, worked around on farms for "Ten dollars a month and all found," in Southern Manitoba to get some first hand experience, and picked up a quarter section farm near Wood Bay and Pilot Mound. In 1912 he sent to Moreton, Dorset for Mable Purchase, who he had known there, and they married in Winnipeg on April 4th, 1912. In a handwritten note about her arrival she said, "We had planned to be married after I reached Winnipeg, but it was Good Friday-the Bans had been published- but we discovered that there had to be a special signature by the Bishop, so it was nealy 9 PM- the deadline- before the ceremony could take place." 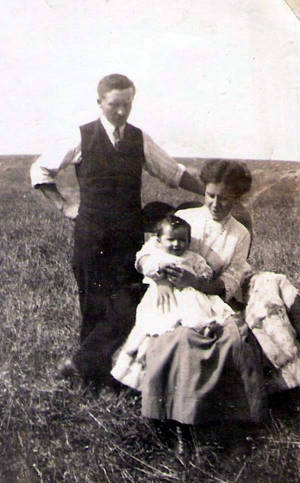 My mother-to-be, Mable Purchase, arrived in Winnipeg on April 4th, 1912, at dad's cousin Percy Hammond's house. But it was Good Friday, and getting a marriage licence wasn't easy in a strange city. (And what nice, English girl would stay overnight without the wedding band?) Finally at 9 PM- the deadline- the Bishop's signature was obtained, and at Saint Albin's Church, Winnipeg,they finally were married. 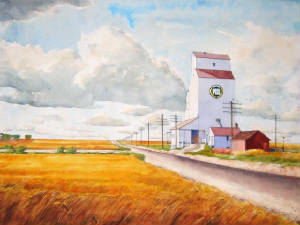 And the happy couple took off by train for the Pilot Mound farm, in southern Manitoba.They were met by a friend at Wood Bay in a box sheigh in a blizzard. (Mable had expected at least a coach-and-four, with footmen, for a "land owner.") Therewere no roads, just trails, and she expected the "manor house" over each rise. "And there it was A SHACK on the prairie," she told us! Above is George Junior, born soon on the farm, but, tragically lost in the 'flu epidemic of 1917. After five years of early and late frosts, grasshopper plagues and rust crop failures, they moved back to Winnipeg, dad joined the army, and was posted for overseas service at Valcartier, Quebec. Although no more dependents were allowed to head overseas, mother wangled permission from her Member of Parliament, and headed there with me, a babe in arms, and toddler Mamie. Except that, with the war winding down, father's draft was cancelled. So, mother visited her family in England, returning to Winnipeg in 1919. There was no running water- and the pond water was hard. Mabel had to make soap from lye and ashes. Later a tank collected rain water, but it blew away, when empty, "for miles and miles", battered beyond use. In January, 1914 the first child, George, was born. The doctor, Dr, Speechly, had to come out from town, was thrown into snowbanks twice, and arrived after George had arrived safely. (Above)-A charming farm photo- taken with a box camera!